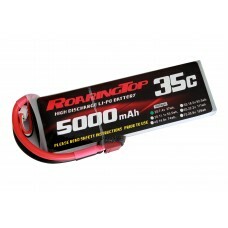 Roaring Top lithium polymer batteries are built to meet the highest requirement of the competition-level customers. Our battery cells are made of patented constituents of electrolytes, which have excellent performance at low temperature (with high discharge current even under -10℃) and higher discharge rates compared with other general batteries with similar density. By adding special nano-tech materials and using automatic/semi-auto equipments during cell processing, we obtain battery packs with high energy density (up to 230Wh/kg), low internal resistance, long cycle life, and high quality consistency. Meanwhile, a proper amount of Li3V2(PO4)3 added to the anode of our battery packs can effectively decrease the voltage dropping speed at the early stage of the battery discharge procedure, featuring flat discharge curve during normal usage. Such unparalleled properties enable our battery packs find broad applications in a lot of demanding RC areas, such as Pylon Racing, EDF, Helicopters, Boats, Cars, and so on. They are lighter than most Li-Po batteries in the market with the same discharge rate and capacity; or say, they offers more capacity and output power than most Li-Po batteries in the market with the same weight! - Ultra-high voltage under load, flat discharge curve, excellent performance at low temperature and high discharge rate. - A lot of punch, power density up to 230Wh/kg. - Patented electrolytes and ultrasonic welding ensures low-resistance, high-reliability and light-weight properties. - Longer cycle life compared with most standard batteries in the market. © 2015 Roaring Top USA All Rights Reserved.